Every stage of a child’s development offers it’s own special endearment. One year olds retain the sweet innocence of babies, there’s the boundless energy of two year olds, and the adorable personality at three. At three, they have more awareness of what a birthday actually means, so it’s time to deliver a special message that will delight these little sweeties. Whether boy, girl, your child, grandchild, niece, nephew, or maybe a friend’s child, make certain they receive a birthday message that makes them giggle. Can you count to three? Let’s try: One year old girl, two year old girl, and a sweet three year old birthday girl! Twinkle, twinkle, little star. Finding the sweetest birthday boy, we needn’t look far! Happy Third Birthday, Little Man. Where’s the happiest, sweetest three year old in the world? Oh, there she is — holding this birthday card – Love you! Three year olds rock; three year olds roll; three year olds make the world a very happy place. Happy Birthday! Left foot, right foot, little tummy, even the tip of your nose is three years old and three years cute. You are three years old today, sweet girl, and you keep making your family happier and happier with every year. Roses are red, the sky is blue, no other three year old’s as sweet as YOU! Happy Birthday. Look at your fingers and count to three. That’s how many years you’ve been precious to me! Lay down, sit up, walk and run. Hope your third birthday is FUN FUN FUN! Hey three year old! You’re as smart as an astronaut flying to space, so get in your spaceship and let’s rock this place! 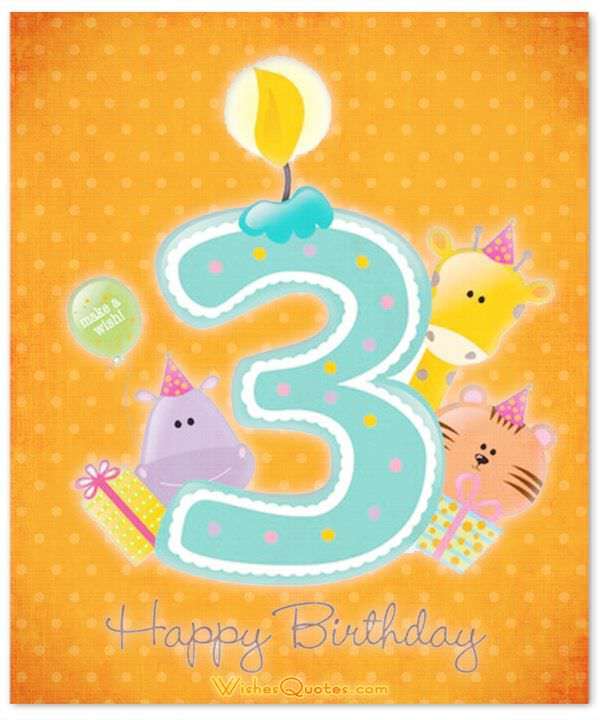 “Moo” say cows, “baaa” say lambs — three year old’s birthdays say “Zip, Zowie, ZAM!! You were an adorable one year old, and a jumpin’ two, but now you’re three, and as sweet as can be! Happy birthday little one. A three year old boy is a jumble of fun, laughing and running and as bright as the sun. Happy Birthday! Rainbows, unicorns, glitter and frills; You’re three today, young lady, get ready for thrills! I met you as a tiny baby, and couldn’t imagine I could love you more than I did then. Now you’re three and I love you three times as much! Wish me a wish for a day filled with joy, a day full of surprises for a three year old boy! Reasons for sadness, I can’t think of one, cuz today is all gladness for three year old birthday FUN! Cake, candles, presents and more. Birthday number three has so much in store. Yay, three year old! Mommy and Daddy brought welcomed you three years ago, but I got a gift when you were born too — I got the most awesome neice EVER. Duck, duck, goose; Milk, milk, juice. Rainy day, rainy day, days filled with sun. Three year olds birthdays are FUN FUN FUN! Wishing my three year old buddy a birthday filled with wagging tails, sand-filled pails, and birthday trains on birthday rails. Hey little cowgirl, let’s saddle up and ride off to three year old birthday fun! Giddy-up little cowpoke! 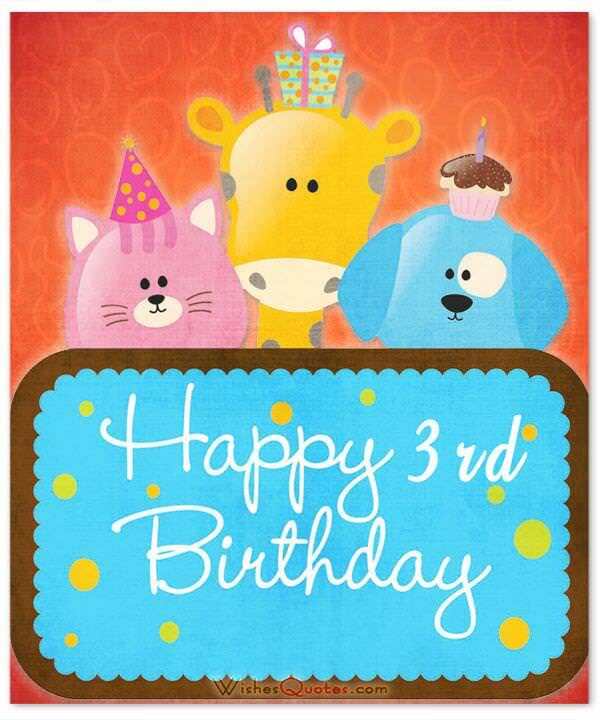 The cows are in the barn and the horses are fed, let’s celebrate your third birthday then run off to bed. Arrrggh, it’s birthday number three, little matey. Let’s set sail for adventure — and cake too! Abra-Cadabra, Ala-kazamm, Presto! The most surprising, magical child is turning into a three year old! Whatever the future holds, whatever tomorrow brings, when I see my three year old neice, my heart just sings! Happy Birthday. Beautiful little boys don’t turn three years old every day. But this is YOUR day, sweet little man! You are growing up strong, happy, smart — and your third birthday gives us a chance to show you how much we love you. Happy birthday! Peekaboo! I see you — the most terrific three year old birthday boy in town! Birthday cake? Check! Three candles? Check! Presents? Check? Sweetest little three year old ever? CHECK!